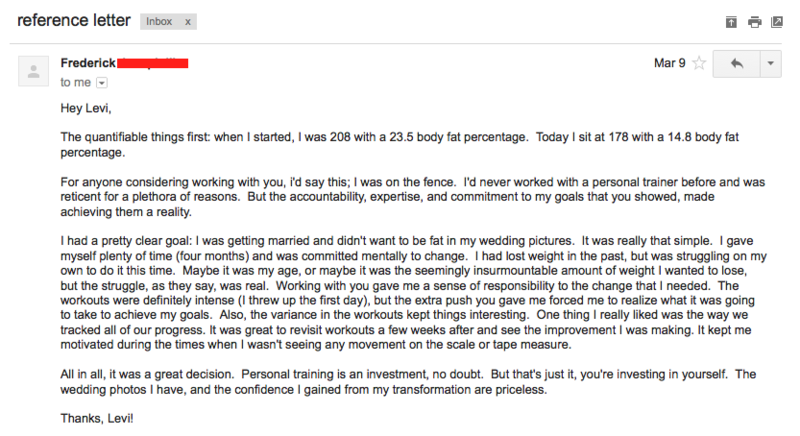 "I had a pretty clear goal: I was getting married and didn't want to be fat in my wedding pictures. It was really that simple... ...I had lost weight in the past, but was struggling to do it on my own this time... ...All in all, it was a great decision. Personal training is an investment, no doubt. But that's just it, you're investing in yourself. The wedding photos I have, and the confidence I gained from my transformation are priceless. Thanks Levi!" "Levi knows an astonishing amount about the human body, and he has creative and fun ways of targeting muscles that you may not even realize exist. Working with Levi is not only a great way to reach your fitness goals, but it is also so much fun!" "Regarding your technical skills, you clearly know how to instruct people to use proper form and to do the right exercises the right way. Like we discussed, I'm not the expert in fitness, and your training and experience were obvious in how you approached our time together. You took our time seriously, and had a vision for what we could accomplish together." "Levi is a pleasure to be around and has a special talent of helping you achieve things that you never thought were possible. He truly has a wealth of information on how the human body responds, and is able to specialize this information for his clients. If you're looking for someone to help you grow physically and mentally, I can't think of anyone better than Levi Kane to help you achieve your goals. You may even exceed your own expectations with the help of this incredible trainer." "I've been training with Levi since May of 2016 and is now a key partner in my health and wellness journey. He knows my goals, and my goals are now his goals. One of my favorite things about Levi (there are many!) is his extensive knowledge of the human body. I like to know how things are connected as well as the science behind it and he gladly explains it to me. 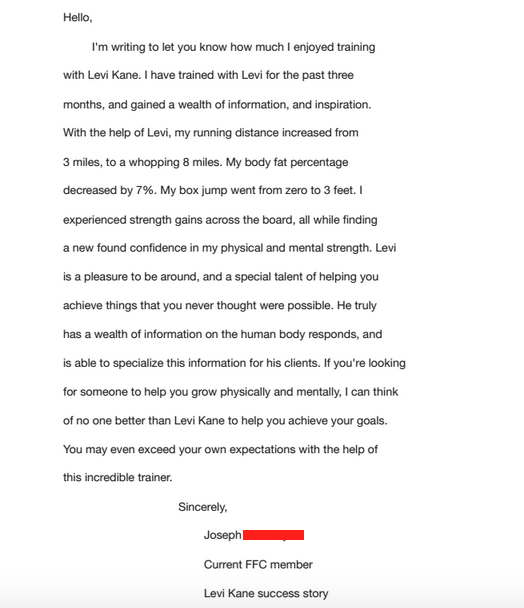 Levi is not only an awesome trainer, he is a teacher and has become a friend." 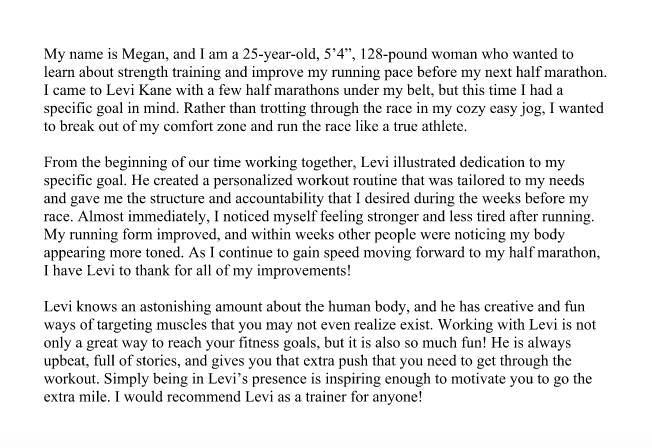 "When I began my training with Levi, he challenged me to push beyond my limits, and to set goals for myself. From that point on I've heightened my standard when it comes to running, strength, and effort in general. He's helped me dig deep and unlock an inner potential that I've had in me all along, but never found." "Passionate, funny and ambitious are three things that come to mind when I think of why Levi excels at what he does. If you would like to make some healthy changes and actually see progress, I strongly advise you to give Levi a shot and meet with him for an initial fitness assessment."